Service on site, around the clock, seven days a week – something the HEINKEL Group demonstrated perfectly with a leading international customer from the pharmaceutical industry. 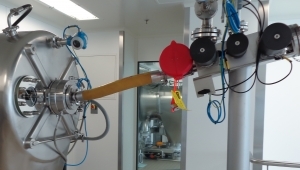 Process engineering adaptations carried out by a competitor on a HEINKEL inverting filter centrifuge led to a stop in production – HEINKEL localized the error on site in next to no time and got the facility up and running again. Adaptations made by an outside company had caused the machine to stop working: An error in the weight taring led to an overfilling of the HEINKEL inverting filter centrifuge type HF 600, which had been in use there successfully for 20 years. For this renowned pharmaceutical customer, which produces APIs in multi-purpose campaigns, downtimes of this kind represent considerable losses. The outside company, which had been responsible for maintenance up until that point, was not able to identify the problem. Regardless of the fact that it was the weekend, an experienced HEINKEL service engineer set off immediately for customer site. After an in-depth check of the system, the engineer soon discovered that the taring of the weight display that had been retrofitted by the competitor company was faulty which in turn meant that the suspension was able to get into the solids area. Production was restarted that very same weekend. During this operation, further problems were identified in peripheral equipment which in the past had already led to production stops and diminished centrifuge performance. As a result, the customer commissioned the HEINKEL team to give the entire process line a detailed check. Discussions with the various operating groups, such as process technicians, maintenance and service personnel, were of great importance as they indicated areas of further optimization potential. This then formed the basis of a cost-benefit analysis by HEINKEL. The customer then decided to extend this successful collaboration and commission further sub-projects. These included, for example, the adaptation of the filling and washing system, pressure regulation in the filtrates area, filling of the solid and modernization of the safety procedures. After the mechanical adaptations had been completed, the first production cycles were analyzed by HEINKEL and further process engineering optimizations put in place. Overall the pharmaceutical company was able to increase its throughput performance by 100 percent and completely automate operation which had, until that point, still been in part manual. The company has stipulated that, in the future, a HEINKEL process engineer should be on site for every product change. With reliable, quick and expert support, HEINKEL was able to considerably increase the efficiency of the production processes. The result: further projects. The customer has now had its entire Siemens S5 control system for the HF 600 changed to a Siemens S7 control system. Thanks to the high throughput performance and reliable operation, the customer decided to have other products manufactured with the HEINKEL centrifuge, something which had not originally been intended. Furthermore, the successful collaboration led to a HEINKEL inverting filter centrifuge in a neighboring building going through the same modernization measures. News of the project traveled fast. Companies in the customer`s environment have become even more aware of the services offered by the HEINKEL Drying and Separation Group. Other operators have already contacted HEINKEL about possible projects.